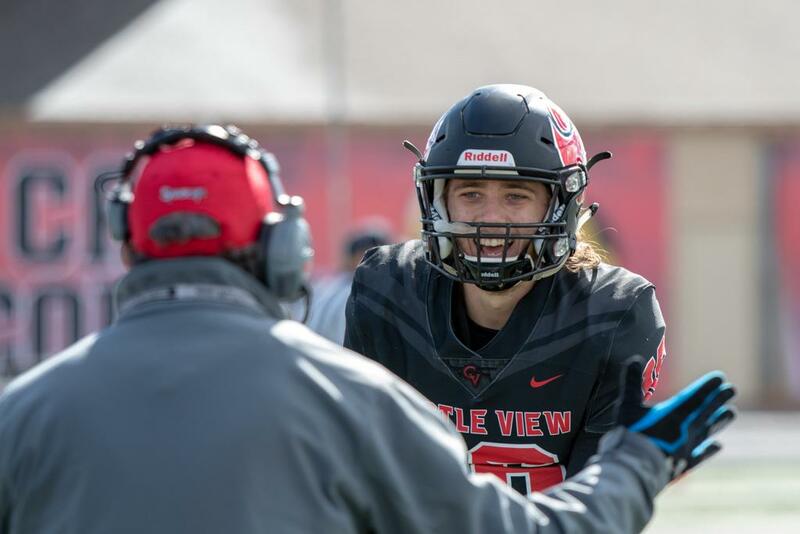 While the clock may have struck midnight on Cinderella last night in a 2nd round playoff matchup vs Cherry Creek, the Castle View Football Team will forever be able to look at 2018 as a positive turning point. After going winless in September and October of 2017, a coaching change was announced and the program was introduced to Todd Casebier, one of the most successful coaches in Colorado High School over the past 20 years. Prior to his first season with Castle View, Casebier had led his previous teams to 18 play-off appearances, 3 state title appearances and one state championship. The coach not only had success, he had engineered stunning turnarounds in remarkably short periods of time with programs who had been previously experiencing futility. Prior to his arrival at Montrose back in 2002, the team was 1-10. Casebier went on to lead the team to become a perennial 4A powerhouse, compiling a record of 83-30 including a state title appearance over his 10 years there. In 2014, Casebier accepted another rebuild role at Fruita-Monument, where the Wildcats had only managed to win one game in 2013. Casebier again architected an abrupt and successful change, leading them to their first ever 5A state playoff win in 2014. Fruita-Monument was a perfect 10-0 in the regular season in 2017. A lot can happen in a year. Just over 12 months ago, the Sabercat Football program had just suffered their 9th straight loss, wrapping up a 3-year period that was only able to produce 6 wins out of 30 games. The program was stuck and its players, coaches and fans were gripped with doubt. When things are not going well, it is hard for a team to believe they can succeed. It appeared time for a change and radical culture-shift. With the stepping down of the former coach, the Castle View football community along with the Athletic Department and Administration knew the next head coach would have a big job and that the hire would be extraordinarily important. The school came up big in the hiring of Todd Casebier. From the moment of his arrival, expectations began to rise. The culture shifted and little by little, doubt began to erode away. Castle View Football has just completed their best ever 5A season by going 8-4. Prior to 2018 and since joining 5A, the program had only ever managed to win 4 games in a single year. This previous mark was shattered this season and Castle View went on to host and win their first ever 5A playoff game. The 4 losses came at the hands of 4 playoff teams, 3 of which are in the top 10 in the state. The success in the regular season saw Castle View win more games this year alone than the past 3 combined. When coupled with the playoff success, it is hard to deny that 2018 was total and complete success. When you look back to see how far the team has come, it is a significant and remarkable feat. This team changed the trajectory of the football program. 2018 will be looked upon forever as one of the great turnarounds in state 5A history. Most importantly, Castle View Football is standing proud once again.